Christie’s Hong Kong Magnificent Jewels sale on 27 November will feature a very special piece: The Moon of Baroda – 24.04-carat pear-shaped, Fancy Yellow diamond worn by Marilyn Monroe when she sang “Diamonds Are a Girl’s Best Friend” while promoting the 1953 classic film Gentlemen Prefer Blondes. According to Christie’s, upon laying her eyes on the stone Monroe gasped and said “It’s gorgeous!”. It was the largest diamond she ever wore in her lifetime. 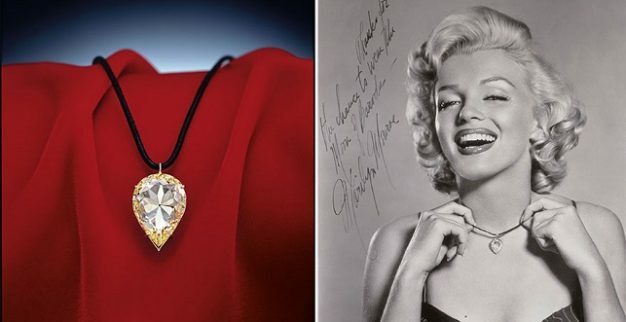 The diamond will be offered along with an autographed photo of Marilyn Monroe wearing the 24-carat stone. The unique diamond was mined in the legendary Golconda mines in India – the source for the Koh-i-Noor and the Grand Mazarin stones. It is estimated that it was mined between the 15th and 17th centuries. At one time, it “may possibly have been part of the vast collection of the Gaekwads of Baroda, one of India’s wealthiest and most powerful ruling families”, according to Christie’s. it is estimated that the Gaekwads of Baroda has possession of the diamond for about 500 years. In 1944, the stone resurfaced, and was acquired by Samuel H. Deutsch, then the president of a firm of diamond cutters from Cleveland, Ohio. Nine years later, in 1953, Deutsch sold it Meyer Rosenbaum, president of Meyer Jewelry Company in Detroit, Michigan. Rosenbaum was the one to lend the diamond to Marilyn Monroe that same year. In 1990, Christie’s New York put the stone to auction for the first time. It raked in $297,000 — nearly tripling its low estimate. 18 years later, in 2008, the Moon of Baroda was seen in public for the first time in years when it was shown at the Diamond Divas exhibition in Antwerp.